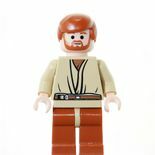 Obi-Wan Kenobi is a minifigure based on a character from the Star Wars universe of the same name. 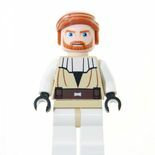 To date, twenty-five variants of Obi-Wan Kenobi have been released, with another one to be released later in 2014. 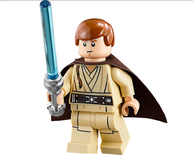 Kenobi first appeared in the opening year of the LEGO Star Wars theme—1999. 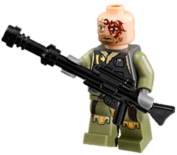 He has also appeared in four LEGO Star Wars video games, with a total of eight different characters. 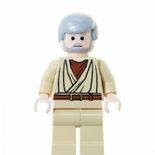 There are several different versions of Obi-Wan, blah blah, hooray! 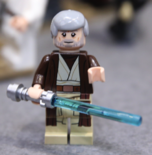 Obi-Wan was a Jedi. 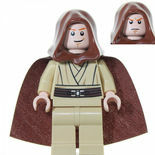 When he was little, he killed Darth Maul after Darth Maul killed his Master, Qui-Gon Jinn. 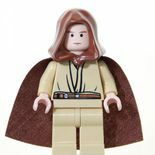 Then he got new hair and started training Anakin Skywalker. Anakin and Obi-Wan fought together in The Clone Wars. But Anakin got angry and went to Palpatine for mental help. But Palpatine was actually the big bad guy, and he made angry Anakin into his new tool, Darth Vader. Vader and Obi-Wan fought on a big lava planet. Obi-Wan won and made Vader roll down into the lava. But Palpatine got Vader got a cool shiny black suit so he lived. Obi-Wan ran away and took Anakin's son Luke to Anakin's home planet because the Jedi were being hunted now the Republic was the Empire. 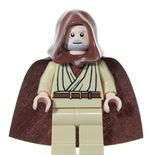 He hung out in his house until Luke grew up, then they went on their first mission. But shiny black Vader showed up and killed Obi-Wan, making him into a ghost. Ghosti-Wan still talked to Luke lots, and years later Luke made Vader back into Anakin and Anakin killed Palpatine. Obi-Wan and Yoda were happy ghosts on Endor with Luke, while Episode III ghost Anakin kinda just stood there and glared at Luke awkwardly. 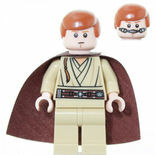 Obi-Wan heads from the 7255 General Grievous Chase were incorrectly added to several of the earlier releases of the 7665 Republic Cruiser instead of Qui-Gon's head. Kenobi is in the set 7962 Anakin Skywalker and Sebulba's Podracers, however he is not in that scene in the movie. 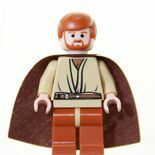 Obi-Wan was voiced by James Arnold Taylor in LEGO Star Wars: The Padawan Menace, the official audio double for Ewan McGregor's Obi-Wan Kenobi, as well as the voice of Obi-Wan Kenobi in The Clone Wars movie and TV series. 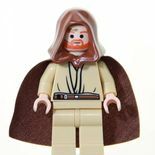 In a LEGO Catalogue his name is misspelt as Obie-Wan Kenobi several times. 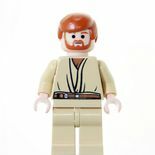 In Revenge of the Brick, Obi-Wan has a similiar appearance to his latest Jedi Knight variant, even though the movie was made a few years before the figure. 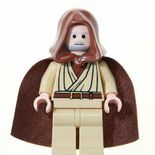 Descriptions of Padawan variants only. 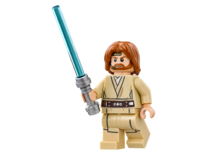 As a Padawan, Obi-Wan was apprenticed to Jedi Master Qui-Gon Jinn. The two had lots of fun adventures until one day Padmé rang them up and told them to stop the little green men and their pet robots. In the end, Qui-Gon died. It was all very sad. 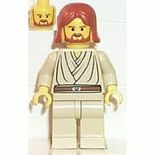 But Obi-Wan got promoted! This page was last edited on 30 July 2017, at 01:55.